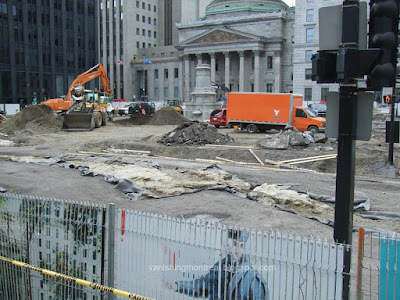 The Place d'Armes square in Old Montreal, in front of the Notre Dame Basilica, was totally leveled this past summer. And what a sight it was. The square as it used to look like can be seen in the bottom picture (from google maps). Considering that it took the city forever to update Dorchester Square in Downtown Montreal, I didn't go back in Old Montreal to see if it was completed yet. Addendum: I just read an article at La Presse about this and the square has been like this since september 2009 and they stopped the renovations during the summer of 2010, at the height of tourism, and probably only restarted this fall. 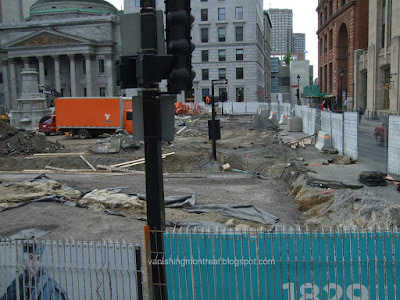 It's amazing that it's taking longer than the Dorchester Square renovations. Also, the square was spruced up back in 1960. The last photo shows a computer simulation on how it's going to look like. 2 years to lay down some pavement. Second addendum: I just learned that the renovation was delayed because while digging up around the square, they found archeological finds, like an old sewer and a wall that was part of one of the first buildings built in the area. I just found out about your blog via spacing montreal. It's always strange to see how a city in evolving - for the better or not. We all feel nostalgic aboout the past and especially about the industrial past when i comes to buildings. 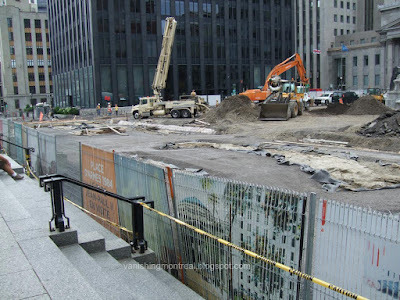 One thing i know is that all buildings cannot become landmarks, many must be destroyed to make place for new so the land is put to better use. I recall the Loews, it was put down for some reasons and it was filled with a club med world for some times. That failed miserably and now the magnificent theater is lost. If there was a plan, downtown would be inviting, the South east would boom beautifully, hochelaga would rise from the dead etc. You know the list and how it could go. What is it with our city ? The Loews was built during the golden age of movie theater. I remember going to the original one back in the 1970's. Then it's been divided into smaller rooms. They pretty much made a multiplex oout of it. The results was that a lot of the original design was butchered !! but the main scen was roughly spared. When the multiplex was closed down Club Med tried to revive it but with no success. As far as Place d'Armes is concerned : paving of the rue de la Place d'Armes ouest along the Banque Nationale building, it's been paved with cobblestones and reopened to traffic recently -as rue Notre-Dame. N-D is covered with granit stone of different tone of grey just like the rendering suggests. In front of the church the street is covered with very light gray stones -recreating the shape of the first church of the parish. You can see it in the rendering. 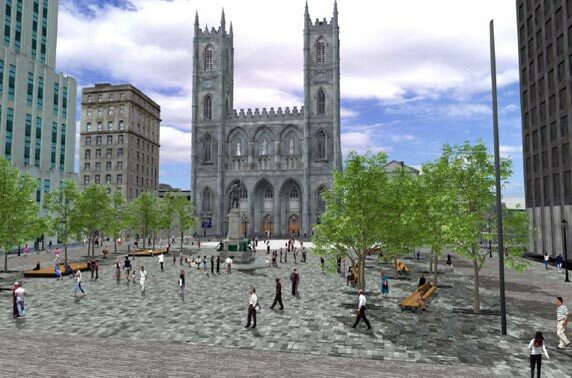 The final stage of the redesigning of Place d'Armes will start again in spring of 2011 to be finished in 2011.